The Low Down: Miranda North seems to have amnesia. She knows her name, but can’t remember how she ended up at the mall (or much of anything else for that matter). Her anger gets the best of her when an unhelpful security guard refuses to believe her story, and then something horrible happens. There’s a panic, and people begin to run blindly. A boy screams for his mother. A man hits a guardrail and flips over to the floor below. What is going on? After everyone has cleared out, Miranda thinks she is alone with her huge headache. But there, in the food court, sits a boy who is watching her. Then he waves her over and tells a story that makes no sense. Something about psychic energy and what just happened not being her fault. Then there’s that faint smell of roses. Peter, the boy, takes MIranda home and tells her the story of Noah and Olive, their two best friends who have run away. About the shots they have to take, and the training they’ve had.Slowly, random bits and pieces of Miranda’s memory start to resurface. Then one night, after Miranda and Peter have found Noah and Olive, they arrive home to find their house engulfed in flames. Then they are attacked…by their exact twins. Best Thang ‘Bout It: This is a thriller in the truest sense of the genre: the mystery that is Miranda; what is really going on at the hidden facility where they all live; who their parents are; and what Miranda, Noah, Peter and Olive are being trained for. Who is in charge? How can they keep from losing their memories? Are they their memories? I’m Cranky Because: While I liked the main characters, I still felt distanced from them. That could be intentional on the part of the author due to the storyline, though. Should You? : Yes, but be sure you keep a watch over your shoulder for your doppelgänger. 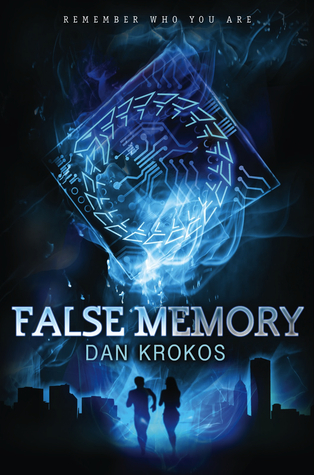 False Memory by Dan Krokos was published on August 14, 2012 by Hyperion.